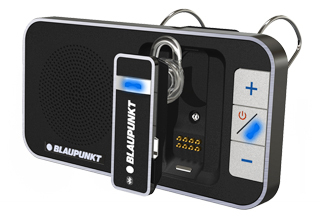 The BT Drive Free 211 is a combination of a Bluetooth® headset and a Bluetooth® hands-free device. The docking station is very easy to install in the vehicle, on the sun visor, for example. The headset can also be used separately for calls, independently from the docking station. The BT Drive Free 211 features outstanding hands-free voice quality and ensures convenient and safe use of the telephone while driving.